In her recent New Yorker article, “The Sorrow and the Shame of the Accidental Killer,” author Alice Gregory claims there are no self-help books for anyone who has accidentally killed another person. Nor published research, therapeutic protocols, publicly listed support groups, nor therapists who specialize in their treatment. She profiles several such tormented souls who bear their burdens largely alone. 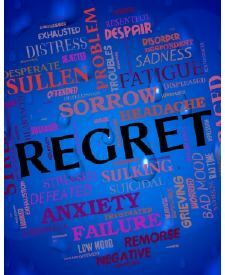 Yet dealing with guilt, shame, and regret is a mainstay of both self-help and professional therapy. A simple online search reveals page after page of self-help websites, therapist and clinic practices, newspaper and magazine articles, all about forgiving oneself, learning to accept one’s failures, and letting go. In that sense the piece misleads about the lack of help available. Indeed, although I don’t “specialize” in the treatment of those who accidentally kill another person — as best I recall, I’ve never worked with this specifically — I join many of my colleagues in welcoming any such person into my practice. Gregory implies this particular remorse is unique: qualitatively different and far worse than regrets about bad marriages, abusive parenting, ruined businesses, accidental self-harm, and so on. And so it is, in the same way that murder is usually considered the worst crime. Taking a life, even unintentionally, is irrevocable and can’t be remedied. Each life is one of a kind. Does this render all the self-help moot? the army of therapists clueless? Does it take an elusive specialist to help in such severe cases? Experience can’t hurt, of course. Just as an experienced addiction therapist readily spots enabling and codependency; just as a therapist well versed in psychodynamics quickly senses subtle inner conflict; just as an expert cognitive therapist knows how to tailor a welcome intervention; so too a therapist who has worked with many guilt-ridden, self-punishing CADI (“Causing Accidental Death or Injury”) clients would know which interventions are usually helpful. Lacking such an expert, should a sufferer reach out for the far more accessible, if less tailored, help out there? By all means. Although CADI is an extreme case, no one’s life story or emotional burden is exactly like another’s. No one’s guilty remorse — or depression, anxiety, or self-sabotage — is quite the same as anyone else’s. No therapist, no matter how experienced or specialized, can know beforehand exactly where a patient or client is coming from. To one CADI client, the phrase “accidental killer” (in the title of the New Yorker piece) may feel just right, to another painfully harsh. Even the value-neutral term “CADI” covers very different situations, e.g., a subway operator unable to stop the train before hitting a suicidal person on the tracks, versus a driver who falls asleep at the wheel and veers into unsuspecting traffic. A widely-read New Yorker article highlighting this forgotten, suffering group is surely a gift to these folks and their loved ones. Yet it would be sad if it left the false impression that only hard-to-find, specialized help is worth seeking. In this situation especially, it’s important to remember our human connection with others, not just our differences.